Today I dived back into Metaplace and I have to say I am now very excited by its potential. I realized I had a stack of invites still so I twittered about it as one does. So why now? Well I am busy looking at all sorts of platforms and anything that lets people just get on and do things, whilst sharing with others works for me. 1. My avatar can have green hair (Something PS3 home and Xbox Live still don’t do for some reason). i.e. flexible to what I personally want to do. It sounds minor but it really is important. 2. The car there as an isometric 3d object that can be rotated through 4 angles has come from Google Warehouse. 4. 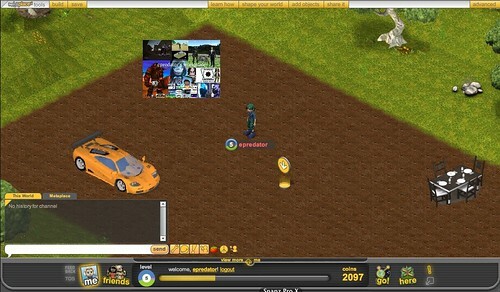 You cant see the alien creature I added from the metaplace store. It is a 3d alien, but I clicked the properties to add movement code to it, and selected it should avoid me as a player. So it ran away. Scripts and code…. tick. So with imports, code to make things happen, all running in flash, backed up by a linked social network its letting people just get on and build. Always a design feature but its working really well.